Juan H. González is the Director of Community Organizing at the Jamaica Plain Neighborhood Development Corporation. He is responsible to coordinate organizing efforts to create and preserve affordable housing, support small businesses and promoting equity. In his country of origin, Guatemala, he worked for the Universidad de San Carlos and the United Nations Development Program. He assisted rural communities designing economic projects, preserving their natural resources, and carrying out leadership development programs. Juan came to the U.S. in 1992, and joined Centro Presente as the Director of Community Education and Organizing and then the American Friends Service Committee, working with Latino immigrants who needed legal and organizing assistance. In 1999 he was hired by the Metropolitan Boston Housing Partnership as a trainer for the Community Leadership and Organizing Center. In 2000 he became the Director of Community Organizing at Allston Brighton CDC and joined the JPNDC staff in September 2007. 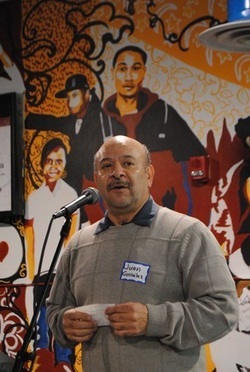 Juan facilitated Popular Education and Community Organizing classes at Southern New Hampshire University from 2003 to 2011, facilitated trainings and workshops with other local organizations about education, community organizing, and tenants' rights. He holds a master of science degree in Forest Ecology from the University of Minnesota, and a BS in Agronomy from the Universidad de San Carlos de Guatemala.